The Dallas Cowboys ended the New Orleans Saints' 10-game winning streak with a 13-10 victory in the NFL on Thursday. This showdown produced a Cowboys team that was sorely missed and a second-half comeback from quarterback Drew Brees that was squandered by an uncharacteristic mistake. Coming into Thursday's game, the Saints were 4-0 when being shut out in the first quarter since 2017. New Orleans trailed Dallas 10-0 at AT&T Stadium, but they are now 4-1. 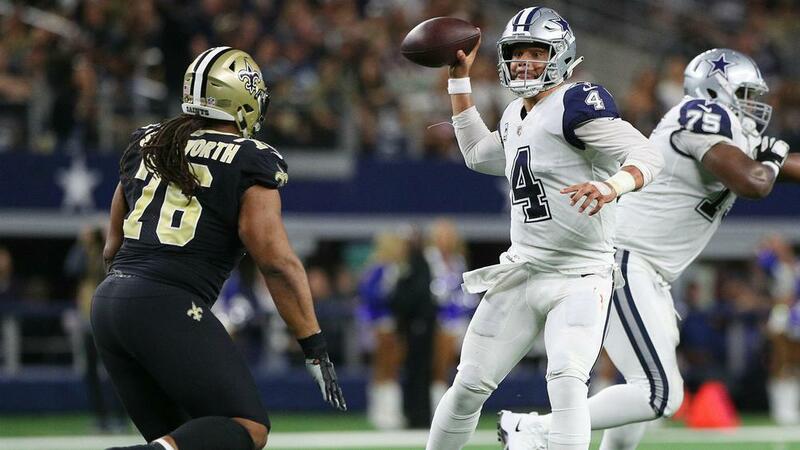 New Orleans were held scoreless in the first half, a feat last accomplished by none other than the hosting Cowboys in week four of the 2014 season. The Cowboys went on to win that game 38-17. Brees' 39 pass yards were his fewest in a first half since week three of 2004, when he was under center with the Chargers. Dallas quarterback Dak Prescott was sacked five times through 40 minutes and seven times in the game. He had never won a game in his career when sacked five or more times (0-4), but that changed, too. This was certainly the case for both teams, as both eyes were on each defense entering the game. The Saints, who boast the NFL's best rushing defense, would be facing the league's best rusher in Ezekiel Elliott, and on the other side, the Cowboys would have to stop Brees and the streaking New Orleans squad. Both teams made a valiant effort as the Saints held Elliott to 76 yards – the sixth time this season he has run for fewer than 100 – while also getting to Prescott seven times for a loss of 40 yards. But, Dallas overcame six second-half defensive penalties and used a pick late in the fourth quarter to secure the win. It was only the third interception thrown by Brees this season, and cornerback Jourdan Lewis' first interception of the season. It was one of many big defensive plays from the Cowboys, who held Brees to just a 64.3 completion rate, 127 passing yards and one touchdown for his lowest output of the season. The Cowboys needed a high-powered offense of their own and got it through the efforts of Prescott and Elliott. The first half is the best example with Dallas maintaining possession for 21 minutes, 49 seconds. The Cowboys not only held the ball for nearly the entire half, but maximised their possessions by scoring early and often, including a one-handed scoring reception from Elliott. While the Pro-Bowl rusher was held to less than 100 yards on the ground, he had more than 100 yards from scrimmage by adding six receptions for 60 yards. Prescott also looked to Amari Cooper (75 yards, eight catches) and rookie wideout Michael Gallup (76 yards, five receptions) during Dallas' fourth consecutive win – and it was a must win when you look at the playoff picture. Prescott finished 24-of-28 passing for 248 yards with one score and no interceptions. Before the game, Cowboys owner Jerry Jones said the team needed to treat this matchup like a Super Bowl. But, before you get to play in February, you have to make it through the playoffs and this Dallas win made that much more interesting. The Saints' loss knocked them out of the number one seed in the NFC and put the Los Angeles Rams atop the standings. The loss also kept New Orleans from clinching a playoff berth. The win keeps the Cowboys in the driver's seat in the NFC East. Dallas will enter week 14 at 7-5, with Philadelphia still on their schedule. If the Eagles beat Washington on Monday they will be 6-6 this season. And, if Philadelphia can keep up the momentum and hand Dallas a loss on December 9, then the Eagles will gain control of the division with the Eagles winning the tie-breaker. But, consecutive wins from the Eagles still do not promise a postseason run. The Cowboys will need to continue their streak next weekend and then face a fairly easy ride against teams like the Colts, Buccaneers and Giants.